Beat the summer heat with this delicious refrigerator Key Lime Coconut Sheet Cake! There is nothing like a nice cold refrigerator cake in the middle of summer heat. 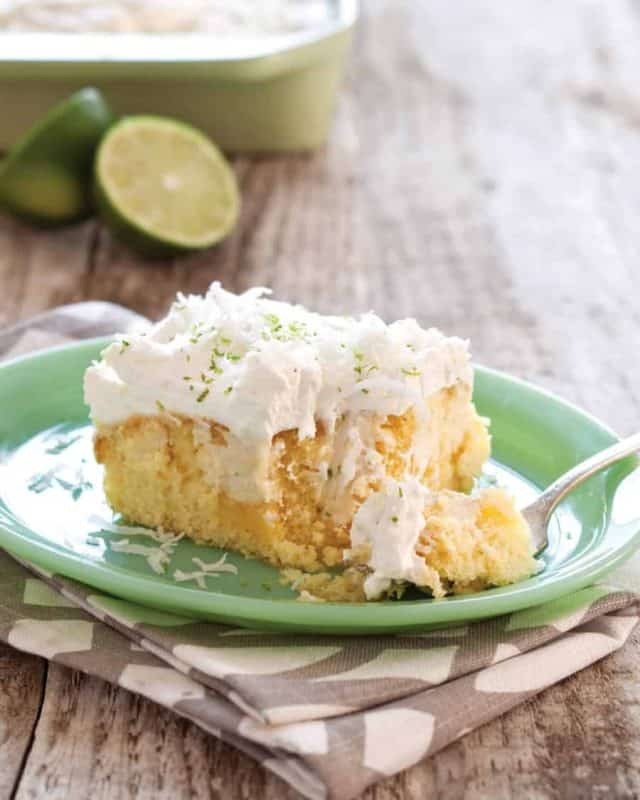 This Key Lime Coconut Sheet Cake features some of my favorite flavors in an ultra moist cake with a light tasting homemade whipped cream topping to bring it all together. Are you looking for a showstopper to take to a get together? This is it! You will be the hit of the party for this one! The fact that it is easy to make and uses easy to find ingredients makes it even better. Preheat oven to 350°. Spray the bottom only of a 13x9-inch baking dish with nonstick baking spray with flour. In a medium bowl, stir together condensed milk, 1 cup coconut milk, and 6 tablespoons lime juice until blended. Using the handle of a wooden spoon, poke holes in warm cake, making sure handle does not touch bottom of pan. Pour coconut mixture over warm cake. Cover and refrigerate until chilled, approximately 4 hours. In a large chilled bowl, combine cream, confectioners’ sugar, remaining coconut milk, and remaining 4 tablespoons lime juice. Beat at high speed with an electric mixer and chilled beaters just until thickened; spread over cake. Top with lime zest and coconut, if desired. Store, covered, in refrigerator for up to 2 days. YUM! I bought a bag of Key limes today and a watermelon. Now, I have this and the watermelenade recipe to try out. Thanks for the great story! Huntsville is a great place for teen drivers and as parent of a son who is 27 and now a new parent, my message is : new driver is only one rite of passage from here on out and being a grandparent is the best job ever! This sounds delicious! I will have to make it for my company coming to visit in a few days. Made this over the weekend and it was AWE-some!!! A huge hit! A wonderful summer dessert. I’m cooking my way through the magazine and my boys are loving it!!! Oh and BTW, the pork chops with Vidalia onion gravy (drool! ), mashed cauliflower, broccoli salad, cornbread topped BBQ chicken pot pie, peach/blackberry buttermilk pie, and stovetop mac & cheese are all soooo good! (Told ya I’ve been busy!) God bless Christy! Christy – forgive my ignorance, but I don’t know how (where) to find “Like” on your new FB group (invite) page, in order to let you know I read/agree to the rules. No worries, long as you’re there and you want to be there, that is all I need 🙂 Welcome and thank you! cream of coconut, the sweet kind , like sweetened condense milk ? Or, just regular coconut milk ? Coconut milk, the runny not too sweet stuff 🙂 Sorry, I responded earlier with the wrong information thinking I was commenting on another recipe! OK, I’m confused…coconut milk is nothing like the Coco Lopez Crème of Coconut used to make cocktails. Coconut milk is thin like milk, Coco Lopez is thicker than sweetened condensed milk. Which one do you use in this cake? It sounds delicious but I don’t want to use the wrong ingredient!!! That’s my fault entirely, I have edited my comment. Earlier, I thought I was commenting on another recipe. So sorry and thanks for catching it! This sounds so good. I can’t wait to make it. I hope you get the chance to make it soon Stacey!! Made it and it was so good!! My 94 year old mother thought it was good even though it wasn’t chocolate! Had my grocer run around the store– which is being remodeled– for about 15 minutes looking for coconut milk, but it was surely worth the wait– should have taken him a piece. I am so glad you liked it Connie!!! We just do not like the taste of powdered sugar…can it be left out of the topping ???? Any suggestions appreciated !! Yummy! Love the Key Lime Sheet Cake and I’m going to try it real soon. I hope you enjoy it Annette!! This was made into cupcakes for a Jimmy Buffett tailgate party-MOST awesome!! Messy as cupcakes but the best flavor-lime zest really made them look extra yummy…plus an umbrella pick or two. Will definitely make again! Thank you so much!! How fun! I am so glad to hear they were a hit!! Two of my all time favorites! Coconut and Key Lime! This looks heavenly! I will be adding this to my recipe box for sure! This sounds delicious! Perfect for summer! Your daddy’s coconut cake from you first book is a family favorite! Another reipe to add to my go to list from you. I’m disappointed that I have to jump through so many hoops to print off a recipe. I’ve joined add this to my address book and a favorite in my files. Easy peasy. Get recipe. Click print. I’m afraid I don’t see the hoops. Scrolling down and clicking print? This is a super short post to scroll through as well. I understand sometimes truly simple things can seem overwhelming if a lot is going on in our lives and so with that being the only foreseeable possibility here, I hope things get better for you soon! I hope you get to try it soon Jacque!! I wish there was a gluten free Christy Jordan in the world! LOL! Some recipes just don’t translate well without wheat based flours/breads. But I’m definitely making this for a summer party. Made this on Friday evening so it could chill well before going to a fish fry on Saturday. Everyone loved it even my husband. None of the stores here had key limes so I used a regular lime for the zest. Did have some bottled key lime juice in the cabinet. Love that this recipe doesn’t use Cool Whip or other brand. Love the regular whipped cream. Next time I make this I think I will add 1/2 block softened cream cheese to the whipped cream to help stabilize it better. Delicious anyway. I am so glad you liked it!!! Let me know how it turns out using the cream cheese!! This sounds so good, I wonder if I could bake it in a bundt pan and/or a loaf pan? The part that comments on letting the cake cool…when I printed your recipe it said: Let cake cool for 5 minutes. Something is interfering during printing that blocks out whatever # is before the 5…therefore, how many minutes do you let the cake cool? THANKS! !